A racketeer is conscripted to the US Army, and when he fails to cheat his way out of service, he eventually deserts. However, he has a crisis of conscience on learning that enemy spies have badly assaulted an elderly lady he looks upon as a mother figure, and the incident leads to the reawakening of his patriotic feelings. 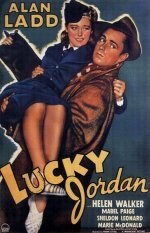 Drama, starring Alan Ladd, Helen Walker, Mabel Paige and Sheldon Leonard.